Captain Cooper ran her on the Ohio River, Parkersburg-Belleville. In December 1892 she ran daily on the Muskingum River, Marietta-Beverly. She also made some trips on the Big Sandy River. In 1897, Captain Webster enlarged her at Parkersburg. She made daily trips Marietta-Beverly from 1893 to 1909. From 1909 to 1910, she ran Marietta-McConnelsville. She sank, while downbound, at Lem Lawrence's landing between Beverly and Luke's Chute on April 19, 1910. The LORENA took her freight and the towboat DARLING pumped her out. In 1911 she ran excursions and substituted for the H.K. Bedford in the Pittsburgh-Parkersburg trade. 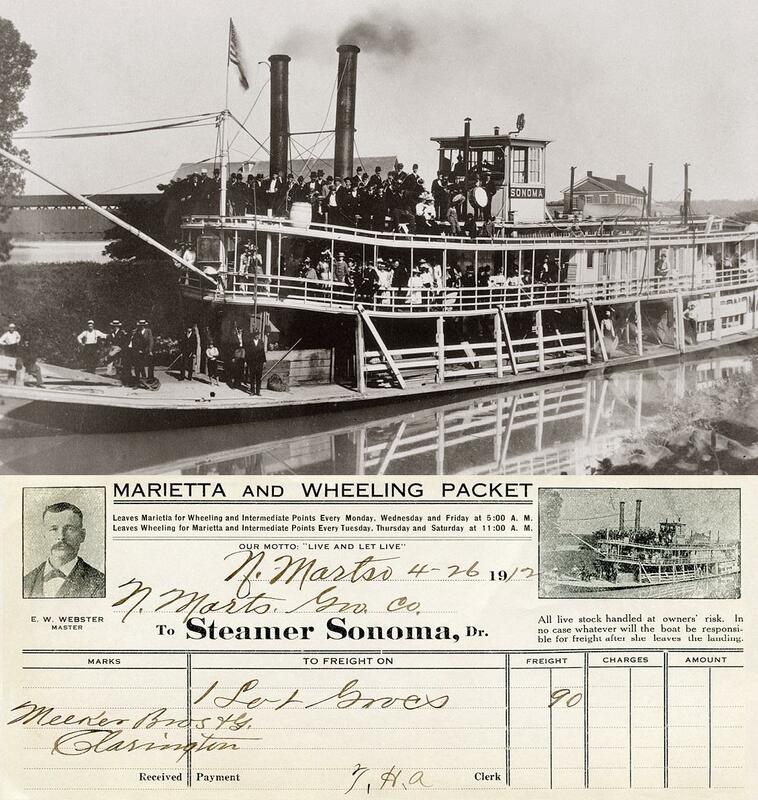 On May 12, 1905, she took Theodore E. Burton, chairman of the Congressional Rivers and Harbors Committee, plus ten others up the Muskingum River, 10 miles from Marietta. By 1913, the SONOMA was in the Madison-Frankfort trade when she turned over and sank on the 3rd of May that year after she hooked a snag while backing out of a Kentucky River landing one mile above Glen Mary in Henry County. Captain Webster (master at the time, pictured in upper left hand corner of the waybill) quit the river after the sinking. The photo of the waybill from the La Crosse collection is the same one that was screened by the printer and placed in the upper right hand corner of the waybill. Built in 1898 by the Marietta Manufacturing Company at Harmar, Ohio for the Zanesville-McConnelsville trade. 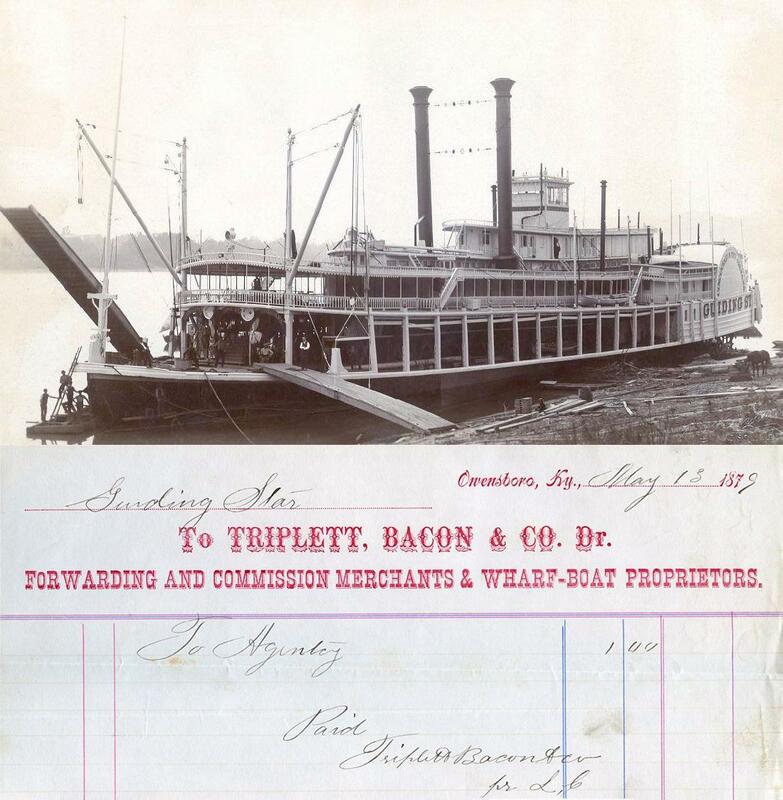 Dana Scott designed the boat and was one of the stockholders in the Muskingum and Ohio River Transportation Company. The boilers and engines were built by Griffith and Wedge Company. She was known as "the speed queen of the Muskingum" and was in competition with the Valley Gem into 1903 when the Zanetta was withdrawn and sold to Captain Greene. She was dismantled in 1903 at Harmar and her engines were used in building the Greenland. Note: This 1900 Waybill for the ZANETTA had a gnarly version of the photo which I replaced with a better duplicate in the La Crosse collection. Originally had engines from the Robert Burns; these were replaced in 1880. The cabin had black walnut and bird's-eye maple finish. There were 50 cabin staterooms, a bar, and a barbershop. Her roof bell weighed 1,800 pounds. She came out in the Cincinnati-New Orleans trade. Captain Miller lost her at a U.S. marshal sale in Cincinnati, June 1881. Captain Hegler purchased her and continued in the trade. After she was lost, her roof bell was used on a fertilizer plant in New Albany, Indiana. Sternwheel steamboat built at Brownsville, Pennyslvania in 1875. 161/4's- 41/2 ft. Two boilers, each 42" dia. by 26 ft. Owned by Capt. Tom C. Sweeney. She was chartered in the spring of 1877 for a trip up the Missouri and Yellowstone. Often ran Pittsburgh-Cincinnati, and out of New Orleans in winter. In 1880-1882 running New Orleans-Opelousas, Capt. H.H. Broad, master, with E. Quatrevaux, clerk. Boilers exploded at New Orleans with loss of life and was demolished. There are several photos of the first GOLDEN ERA which was a sidewheeler (we have a photo of that boat in our museum along with a photo of a model of the boat in a museum in Galena, Illinois) but so far I haven't found a photosof the sternwheeler GOLDEN ERA. This waybill is a scary old artifact that looks like it should have a hand drawn map to a pirate's treasure on the back of it. Same hull as the former GOLDEN ERA, a sidewheeler (1862-1866) and new upper works. Capt. A.M. Halliday, master, with J.S Alexander,clerk, in 1867, and made trips on the upper Ohio. She was taken to New Orleans in the fall of 1868 owned in shares by Captains Gus Hodge, A.M. Halliday, and J. J Blagg. Capt.Gus Hodge, master, and he owned 19/20. Sold March 1870 to Warren P Ketchum, New Orleans, with Capt. B.F Litterall, master. Broken up for scrap July 1870. 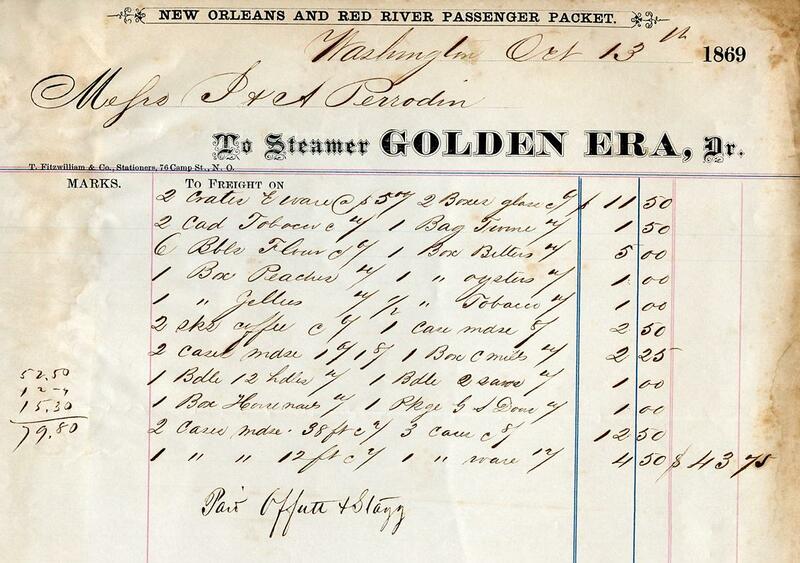 This waybill for the steamer TRENTON was filled out at Washington, a small town on Bayou Courtableau in the heart of Cajun country in St. Landry Parish, Louisiana. First settled in 1720, Washington is the third oldest settlement in Louisiana after Natchitoches and New Orleans. Once the second largest port in Louisiana and a major inland commercial route for the area, Washington was a thriving steamboat town in its heyday. Steamboat service began in the 1820s after Bayou Courtableau and the Atchafalaya River were cleared of obstruction. Horse carts and boats from area plantations brought in agricultural products including sugar, cotton, and livestock. At Washington, everything was loaded onto steamers to be shipped to New Orleans through a myriad of bayous, rivers, and inlets leading to the Atchafalaya River. With the heavy commercial activity during the steamboat days came the necessary structures: warehouses, shops, and homes for the planters and steamboat captains. Much of the original town is included in the Washington Historic District, which is on the National Register of Historic Places. Construction of the Steamboat Warehouse Restaurant began in 1819 and was completed around 1823. Restored in 1977, Jack Womack's Steamboat Warehouse Restaurant, located on the banks of Bayou Courtableau, remains a feast for the eyes and appetite. Enjoy a rendezvous with the past. Settled in 1720, the town of Washington is the third oldest settlement in Louisiana. In 1900, the last steamboat left Washington, and since that time other areas in the state have surpassed the little community on Bayou Courtableau. But Washington has never lost the character and charm of its rich heritage. Antique dealers galore (100+), Magnolia Ridge with 6 walking and jogging trails, historic old homes (many open for tours), and other historical sites. Sternwheel packet Jeffersonville, Indiana, by Howard, 1869. Built for Capt. J W Carleton, New Orleans, who commanded. Connected at Camden, Ark., with the GOVERNOR ALLEN for Arkadelphia, Ark. Sold, April 23, 1870, to Capt. John W. Tobin, entire, of New Orleans. In January 1876 was running New Orleans-Opelousas. Four months after this waybill was written the SANDY No. 2 sank near Baton Rouge. So far have not been able to locate a photo of the boat. 266 tons. Not known if she was a sidewheeler or a sternwheeler. In 1877 she was running New Orleans-Opelousas, under command of Capt. A.P Trousdale, with J.B. Schmidt as clerk. Struck a log near Baton Rouge downbound at 12.30 A.M. May 15, 1877 floated 12 miles while sinking, hit the bank, and sank a total loss. The ROB'T YOUNG isn't listed in Way's Directory or in the La Crosse collection. From Trip 21 of the steamer, a waybill dated August 30, 1876, printed by T. Fitzwilliams & Co. New Orleans. Maybe something more will turn up about the YOUNG one of these days. Another very "distressed by humidity" waybill which I cleaned up to some extent but realized the futility of trying to make it look "as good as new." Am assuming that the diagonal swipe of the pen to the right of the year "187_" represents the number "1" to make it "August 16th, 1871." Haven't been able to find a photo of this boat. Engines, 15's - 5 ft. Built for Captains Tom and John J. Darragh. Owned 1874 by R.P Burton (5/8) and William Barges, St Louis. Often took cotton out of White River to New Orleans. Burned in White River in 1879 and was taken to Mobile, Alabama and rebuilt. Burned there Jan. 17, 1890 with two other boats in a cotton shed fire. 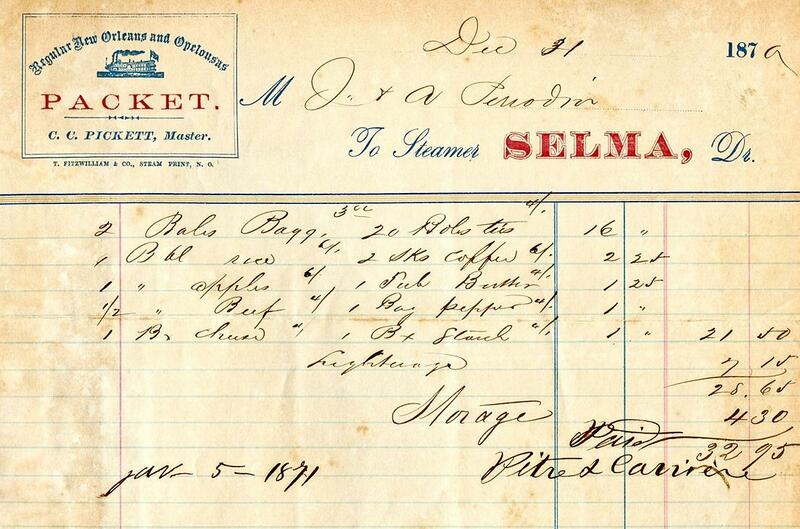 There are 2 dates on this waybill from the SELMA, Dec 21st upper right and January 5th, 1871 lower left. This is another "rusticated and distressed" bill, one of a bunch with "patinas" that may have been kept in a forgotten steamer trunk in a humid location for over a century before they were rediscovered. No photo of this boat has turned up boat yet. 600 tons. 180 x 37 5 x 7. Engines, 20's- 7 ft.
Three boilers, each 48" by 26 ft.
She was back in New Orleans December 1868 having been bought by Capt. William T. Scovell and John Kouns, equal shares. Ran New Orleans-Shreveport. Sold July 1870 to Capt. Charles C. Pickett (whose name is on this waybill. Cap'n Pickett ran her New Orleans-Opalousas and Atchafalaya. Sank and dismantled at New Orleans, Jan. 25 1875. Originally named CARABASSET and was in U S. service under that name during the Civil War. Advertised as running in the New Orleans-Minden-Lake Bistereau trade with Capt. J. J Compere, master, with J.O. Jeffrion, clerk, circa 1866. This waybill was originated on December 27th, 1869 while the ANNIE WAGLEY was in the New Orleans-Opelousas trade, with Capt. M. Kenison, master and T. Jobin, clerk (their names are printed on the document). Snagged and lost in Bayou Lafourche at Labadieville, Louisiana on May 1, 1870. Built at Louisville, Ky , 1870. Went to New Orleans where it was owned by Captain Gus Hodge 50% and Cornelius Dewees 50%. She was a regular on Ouachita and Old rivers, handling cotton. In New Orleans-Opelousas trade, 1879, Capt. M. Kenison, with T. Jobin, clerk. (These 2 gentleman had also operated the ANNIE WEGLEY: see our waybill on the WEGLEY in these pages). The BERTHA burned on the Sabine River, Feb. 8, 1881, while under the command of Capt. Mark Smith. At the time she had been running between Orange, Texas, and upper Sabine River points. Built Jeffersonville, Indiana, by Howard, 1869 125 x 28 x 4. Ran Vicksburg to Yazoo and Tallahatchie rivers, Capt. T.G Ledbetter in command, connecting with the NATCHEZ for New Orleans. 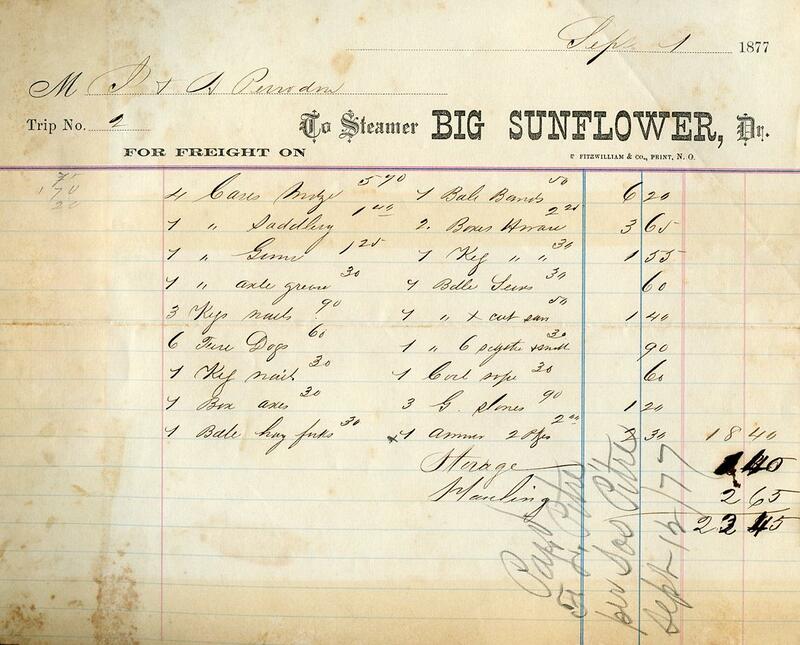 There is some evidence that the BIG SUNFLOWER was extensively altered to become 147.8 x 28.9 x 4.5 with props, renamed JENNIE LANE, and is so registered in 1886 with home port at New Haven, Conn.